2-3/16" dia. hooded dual wheels. Master Mfg. Co Futura Chair Mat Casters - Futura dual wheel caster is designed exclusively for Euro-style" chairs. 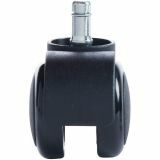 Specially designed 1-1/2" diameter neck fits 1-1/2" diameter chair bases, creating the illusion of chair leg and caster being one unit. 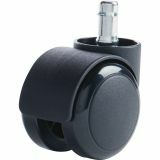 2-3/16" diameter, dual-wheel soft caster is designed for use on hard floors and chairmats. Weight rating is 100 lb. per caster." Specially designed 1-1/2" dia. oversized neck fits 1-1/2" dia. chair legs creates the illusion of a solid unit. 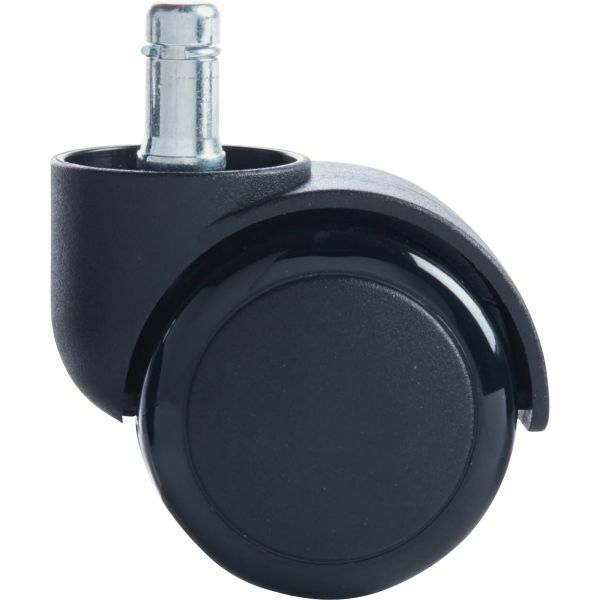 Soft polyurethane wheels for use on chair mats and hard floor surfaces. 7/16" dia. x 7/8" long stem fastener for metal base furniture. Woodclad and metal-based chairs, furniture and other equipment that require 7/16" stem diameter and 7/8" stem length.